The fastest Jet Ski racers in the Pacific Northwest will hit Devils Lake for the first-ever Devils Lake Dash presented by Chinook Winds Casino and Resort. Even though the event about three months away ~ it’s scheduled for May 18-19 — dozens of the best personal watercraft racers and freestyle riders in the Pacific Northwest have already indicated they’ll be kicking off their seasons in Lincoln City. Did you ever wonder what birds are on or near Devils Lake? Perhaps you have seen Bill Henderson’s bird photographs on our Facebook page? Did you know an annual count of bird species has been done on the lake since 2006? The 2012 count for the Otis location identified 36 species and 1,064 during the Great Backyard Bird Count. The Great Backyard Bird Count (GBBC) is an annual four-day event that engages bird watchers of all ages in counting birds to create a real-time snapshot of winter bird populations. Participants are asked to count birds for as little as 15 minutes (or as long as they wish) on one or more days of the event and report their sightings online at www.birdcount.org. Anyone can take part in the Great Backyard Bird Count, from beginning bird watchers, to experts, and you can now participate from anywhere in the world! It is very easy to participate just follow these simple instructions. Let’s expand the data available on Devils Lake birds and have fun doing it! To get started you can download this 2012 GBBC Checklist for Otis which you can use to participate in the count and enter your result later in the weekend. The 16th annual GBBC will be held Friday, February 15, through Monday, February 18, 2013. Please visit the official website at www.birdcount.org for more information and be sure to check out the latest educational and promotional resources. It’s free, fun, and easy. Each checklist submitted during the GBBC helps researchers at the Cornell Lab of Ornithology and the National Audubon Society learn more about how birds are doing, and how to protect them and the environment we share. Last year, participants turned in more than 104,000 online checklists, creating the continent’s largest instantaneous snapshot of bird populations ever recorded. It’s a new year and life on the lake is running at a little slower pace. It is a little rarer to wave at a friend zooming by in their boat or engage in a neighborly conversation during that morning walk. 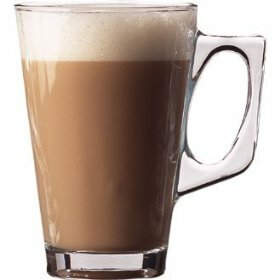 With that in mind, we thought that we would invite you to another, “Coffee on the Point”. Nothing fancy just stop by on Saturday February 16th between 10:00am and noon for a cup of coffee and a sweet treat and say hello to a few of your neighbors. We have had so much fun with Potluck on the Point that a little get together a few times during the year doesn’t seem like such a bad idea. The coffee will be at Mitch and Dana Moore’s; the A-frame at 2929 NE Loop Drive on Sand Point. Come on by! A great group came out Saturday, August 4th for the Fourth Annual Potluck on the Point. Attendees spent the evening visiting with their neighbors while enjoying great food. It was really fun especially the ability to socialize with those you already knew as well as having the chance to make new acquaintances. Mother Nature provided us perhaps the nicest day of the summer. Visit our photo album to get a little taste of the event. We plan to continue the Potluck; we have selected the first Saturday in August every year. So mark your calendar for August 3rd, 2013 and plan on a fun evening. The Devils Lake Revival took place Saturday August 4th from 10-2pm at Regatta Grounds. The event included: educational booths, a variety of kids activities, pontoon boat tours, stand up paddle board lessons/demos, kayak demos/tours, live music, food, veggie and seafood options available, prizes, including a kayak, in water rescue demonstration, and a beach safety presentation. Also part of this year’s event was the unveiling of a two-ton, 13-foot-high sculpture of a lake creature. Sculptors Heidi Erickson and Doug Kroger spent more than two years crafting the towering metal sculpture. It is eighteen feet long, and made from more than 90 percent recycled metal and rubber retread material. Take a moment and visit the creature, it’s quite a sight. 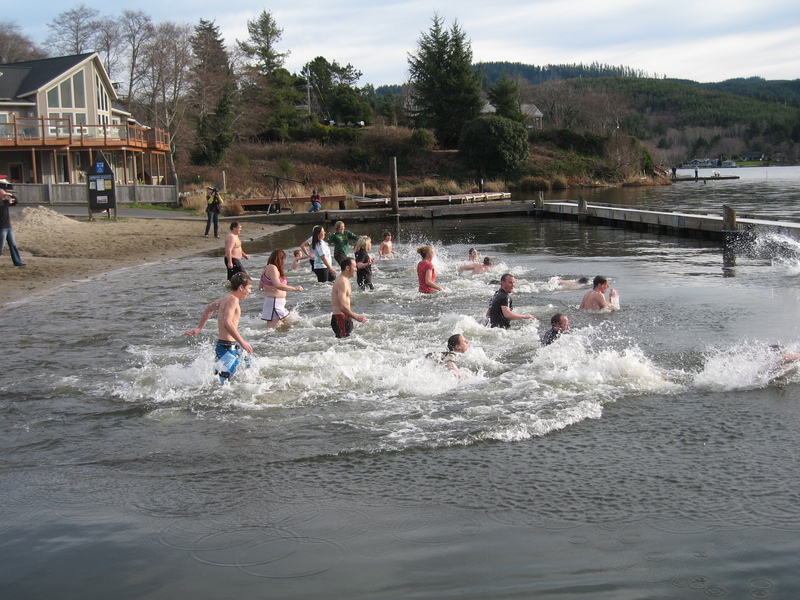 The DLWID sponsored the Devils Lake Dunk, at 11 a.m. Jan. 1 at Regatta Park in Lincoln City. This was the third year for this fun event and a record 26 participants ran into the 43 degree water. We look a series of pictures of the event so follow this link to take a look. The DLWID wants to make sure you don’t miss the Devils Lake Dunk, 11 a.m. Jan. 1 at Regatta Park in Lincoln City. All are invited. Three will win glass floats donated by the Lincoln City Visitor & Convention Bureau. Donuts & coffee will be available. A video from last years event surfaced on Oregon Coast Today’s Facebook page. Enjoy this brief look into how some brave soles bring in the new year on Devils Lake and dig that bathing suit out of the drawer and come on down and take the plunge.